The Peloponnese - Peloponesus - Πελοπόνησος and with it the Argolida - was once linked to Attica by the Isthmus of Corinth and now breached by the Corinth Canal and is a vast and mountainous peninsula that was known in the Middle Ages as Morea. These two landmasses enclose the Saronic Gulf, which is by far the most famous sailing and charter area in Greece due to its proximity to Athens. 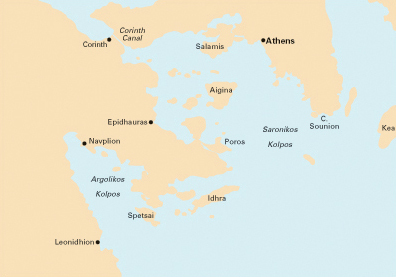 A second excellent yachting area is the Argolic Gulf (see map below). The Peloponnese landmass itself is made up of high peaks, inland basins caused by subsidence and irrigated coastal plains. At the centre, between 600m and 800m - above sea level, lie the pasture lands of Arcadia. The eastern coastal plain, the Argolida, Argolis or Argolid, which is dominated by the citadels of Argos and Mycenae, is devoted to cereals, as well as orchards and market gardens. The southern coast is split into three promontories; the longest, an extension of the Taygetos massif, is Mani , a wild limestone region inhabited by people of spirit. Taygetos is flanked by alluvial plains, free from winter frost: Lakonia round Sparta and Messinia round Kalamata. The smiling fields produce grain and early vegetables while the figs and olives of Kalamata are well known for their quality. 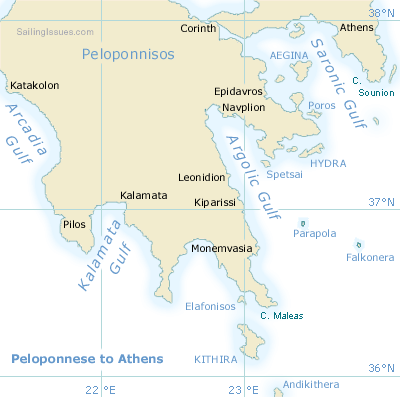 The Argolida was the heart of Greece from 1600 to 1100 BC under the Mycenaeans. With their decline, the Dorians controlled the fate of the region until the conquest of the country by the Romans. During the Byzantine era the Argolid shared the fortune of the rest of the Peloponnese. It was ruled by the Franks and surrendered to the Turks in 1460, Navplion, however, remained in Venetian hands until 1540. Navplion was the capital of the newly formed Greek state from 1828 to 1834, when this role passed to Athens. Click on the thumbnails to see a larger image. The satellite images are active maps: mouseover to see the names of cities and islands of the Argolida and Saronic Gulf. 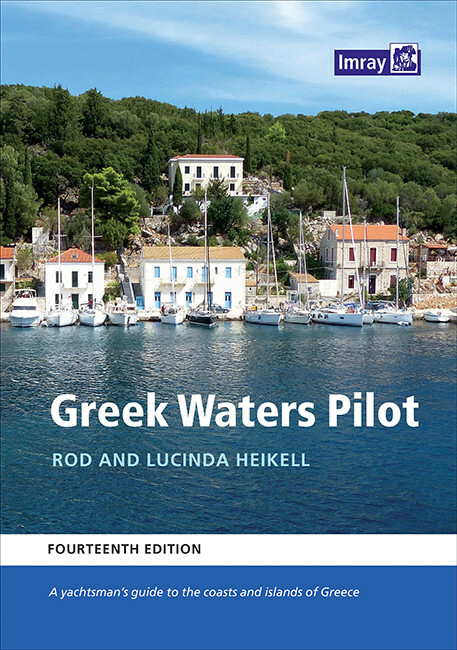 A yachtsman's guide to the entire area from the Ionian Islands to the Aegean, Rhodes and Crete and includes details of over 450 harbours in a single volume. → All nautical charts for the Greek Islands and Turkish Coasts.